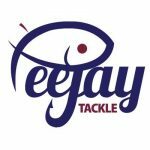 After the junior match the other week where the winning weight was over 100lb in three hours, everybody was well up for this one and all the talk was of 200lb weights and needing five keepnets. 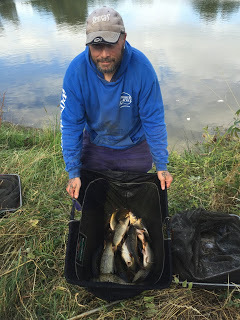 I wasn’t so sure and still thought 100lb would be a good weight in six hours as there were only five juniors fishing that day and we had thirteen booked in, so not as much space and a lot more bait going in. Also with the farm using the pond for irrigation, Harry said the level of the pond was well down and I wasn’t sure how that would affect the fishing. We all met at Cartgate to do the draw and I have to say their breakfasts are really good, as always a fiver comes out of the entry fee to go to a charity of Harry’s choice and there was also a really nice gesture from Scott Russell who donated two prizes for a guess the winning weight competition with all the proceeds going to the charity as well – thanks Scotty! There were a wide range of guesses from 93lb to 263lb, I went for 135lb. Rob announced the draw and I pulled out peg 8 which put me in the corner on the left as you get to the pond. Along with the regulars, a certain Steve Chant was fishing today and it was lovely to see Stoke’s sexiest man for the first time in ages. As I walked round the pond I was surprised at just how low the level was but when I reached my peg there were quite a few small carp underneath some scum in the margins which made me think I could be in for a good day. I had Rich S on my left and Jake was on peg 9 on my right, opposite I could see Terry, Justin and Adie and then Harry and Chanter were on the reed pegs. Looking across the pond from my peg, you can see how low the level was, where the anglers are setting up is normally under water! I could get down nice and close to the water but when I chucked my keepnets in I was a little concerned at the lack of depth in the margins. 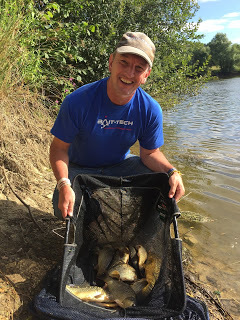 I set up a little Preston dibber for fishing shallow with hair rigged banded pellet, a Trabucco dibber for fishing the margins but I had to come off the bank a fair way to even get a foot of depth and when I plumbed up with a deep rig it was only two and half feet deep at 10 metres! 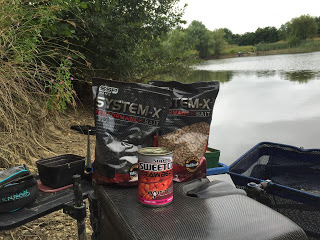 On the bait front I was keeping in simple with 6mm SSP Baits beige gravel and dark silt pellets, some softened 4mm’s and Bait-Tech Strawberry Corn. Harry whistled to signal the start and I cupped in some 4mm’s and corn on my two margin lines before shipping out with the shallow rig and lifting and dropping the rig while firing in a few pellets constantly. I was expecting the elastic to get ripped out at any moment but it didn’t happen, I could see Jake, Terry, Adie, Harry and Scott all into early fish so why wasn’t I catching? It took 25 minutes before I had my first fish but it was a false dawn and after an hour I still only had one carp and I was already a long way behind most of the anglers I could see. But then as the second hour began, it was like somebody had flicked a switch and everyone stopped catching (not that I ever started!). I did manage another carp shallow and one on the deck on corn but it just wasn’t happening. I had a quick go in both margins but never had an indication so it was back out shallow and going through the motions. 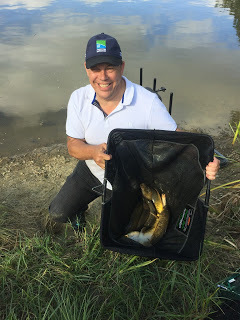 I did stick another section on and went out to 11.5 metres which resulted in another fish but I just couldn’t string two bites together. 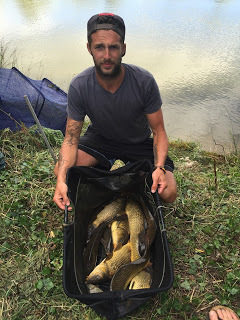 Jake and Adie were still getting odd fish as was Harry ‘Snapper’ Hebditch although he was now on the waggler as he’d broken his pole yet again. After an overcast start, the sun was now out and it was a lovely day which prompted Justin in peg 11 to take his shirt off and the glare from his lily white torso was blinding, luckily he was on the opposite side of the pond from me so I wouldn’t have to see it close up! 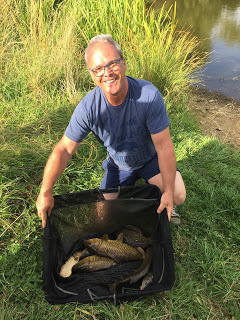 With around two hours of the match left and only had a handful of carp in my net, I tried my left hand margin again but this time with my shallow pellet rig and to my surprise the float sailed away resulting in a small carp, two more followed quite quickly before it died. 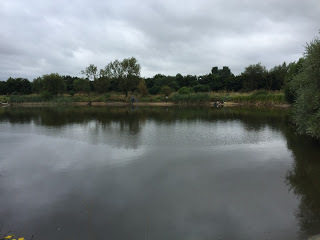 I then noticed a puff of silt from the right hand margin and had a couple of carp from that swim and there were obviously some fish mooching about but they just wouldn’t settle in the shallow water and any hopes of a grandstand finish soon disappeared. Harry called time and my final tally was 15 carp which I knew would do me no good today, I packed up while two of my three keepnets dried in the sun! The scales started with Steve P who had 9lb, then Rob had 5lb 8oz from peg 5, Leighton and Rich S didn’t weigh before it was my turn and my carp went a level 15lb. 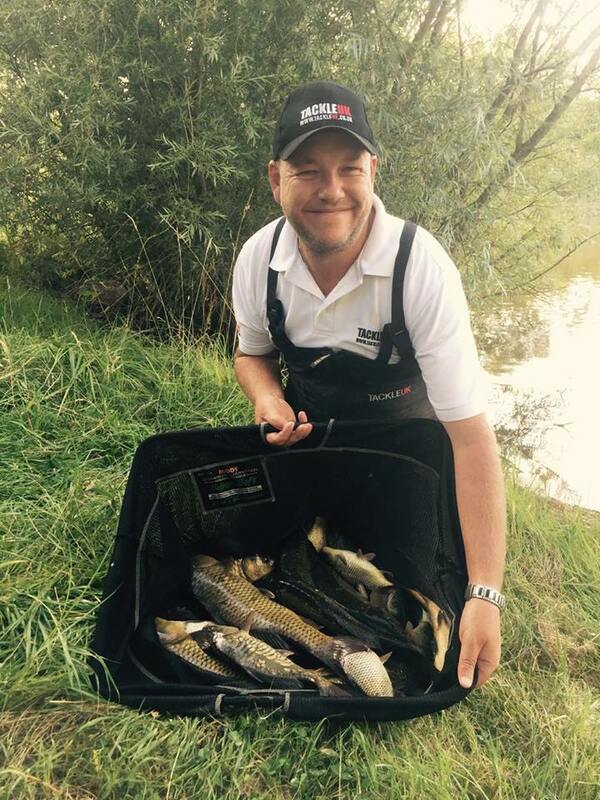 Scotty was next to weigh and he went into the lead with 29lb 7oz, Hurf had 7lb 12oz and then Chanter weighed 17lb 5oz from peg 1. 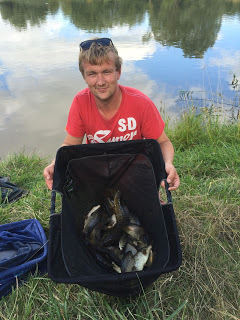 Harry had 21lb 8oz to go into second place but was then pipped by Adie with 25lb 12oz on the next peg. 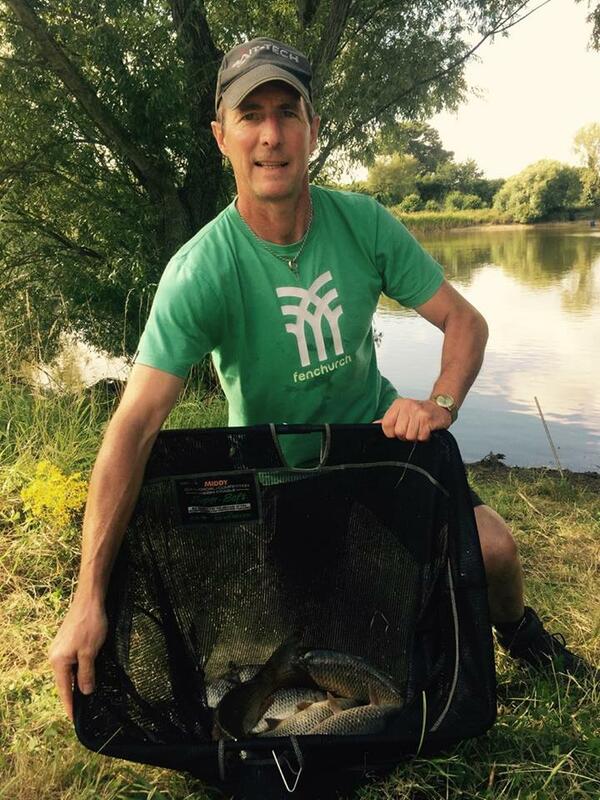 Justin didn’t trouble the scales but thankfully he’d put his shirt back on and then Terry had 15lb 8oz with all his fish coming in the first 45 minutes of the match, last but not least was Jake who had 25lb 8oz and third place on the day. 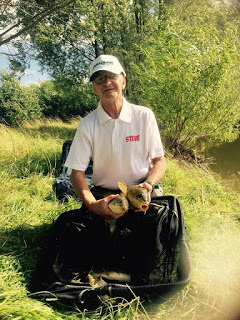 Terry had 15lb 8oz in the first 45 minutes and then nothing for the rest of the match! So it had been really hard going for everyone although it was actually quite a close frame, I wasn’t too far away from the leading weights and my poor first hour when most of the others caught well has cost me. As for the guess the weight competition, Rich S came closest with 93lb, so not too far away! 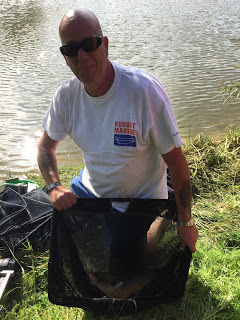 It was still a nice day and we raised over £100 for Harry’s chosen charity and on behalf of the anglers that fished I would like to say a massive thanks to the Hebditch’s for letting us fish the pond and also to Scott for his very kind donation. 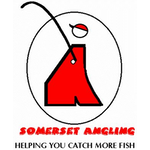 I’m looking forward to fishing it again when the levels back to normal. So my bad run continues and we’re at Dillington next week and I’ve been struggling out there as well in recent matches!